By Robert Jansen M.A. and Greg Young M.S. Ed. 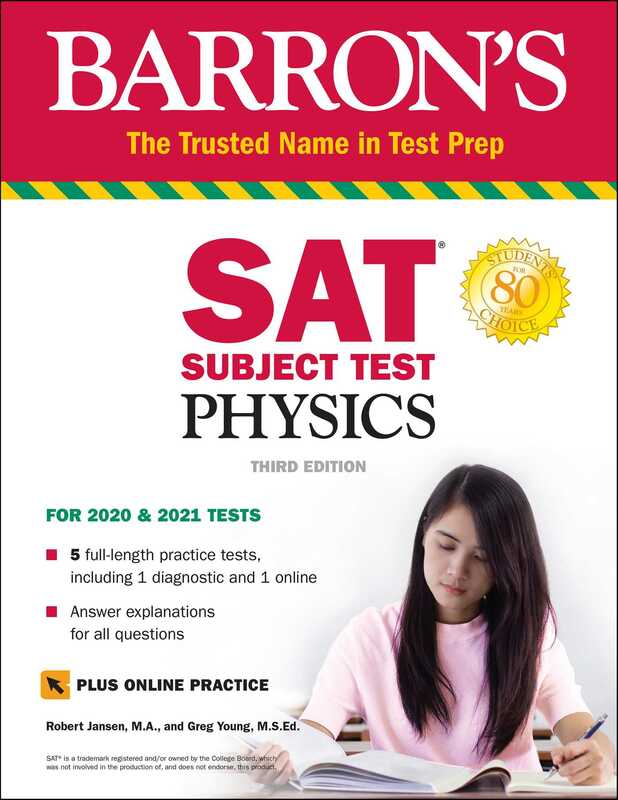 Barron's SAT Subject Test Physics is updated to reflect the current test and features three full-length practice tests along with detailed content review and expert tips to help students improve their score. Extensive subject review covering all topics on the test, including mechanics, electricity and magnetism, waves and optics, thermodynamics, and more. Online Practice Test: Students also get access to one brand new, full-length online practice test with all questions answered and explained. Unique features include a “What’s the Trick?” approach to solving problems quickly and effectively. Additional tips, called out with “If You See…” are included within the chapters to give test takers critical insight into difficult concepts, and QR codes are provided at “Key Concept” areas link to short videos to enhance instruction. The authors also provide general examination strategies and a detailed appendix with equations, physical constants, and a basic math review.